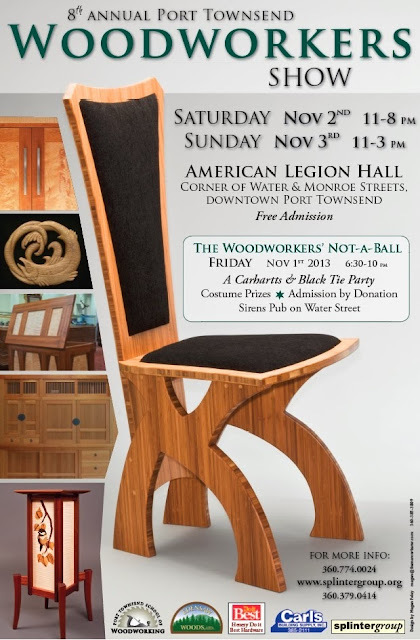 Thank you for joining us at the 2013 Port Townsend Woodworkers' Show! Another show is over. As ever we (the exhibitors and organizers) had a great time and we really enjoyed all the conversations. If you missed the show click on the photograph above to see a gallery of all the work at the Show. We'll be back next the first weekend in November 2014. We've had a couple of last minute cancellations and would encourage woodworkers, furniture makers and wood artisans from Port Townsend to enter the show. Please let us know not later than Wednesday 10 /23/2013 by 5:00pm.